It’s a fact. Getting outside is good for you. There’s a real transformative nature in simply filling your lungs with fresh air, taking in the birdsong and enjoying a leisurely stroll through the countryside. Fortunately countryside is something that Cornwall is blessed with a lot of, and with our many gardens in bloom, why not see for yourself this summer? 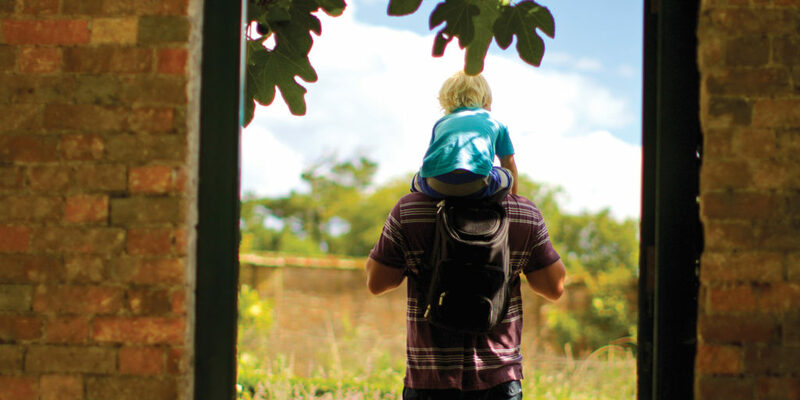 A visit to a garden makes the perfect family day out – a great way to bring everyone together, and ideal for young families to enjoy a picnic in a contained environment. More importantly, what better excuse for enjoying a cream tea in a beautiful setting? The sheltered south coast in particular has a huge concentration of gardens, stretching from the mouth of the Helford river all the way up beyond St Austell. 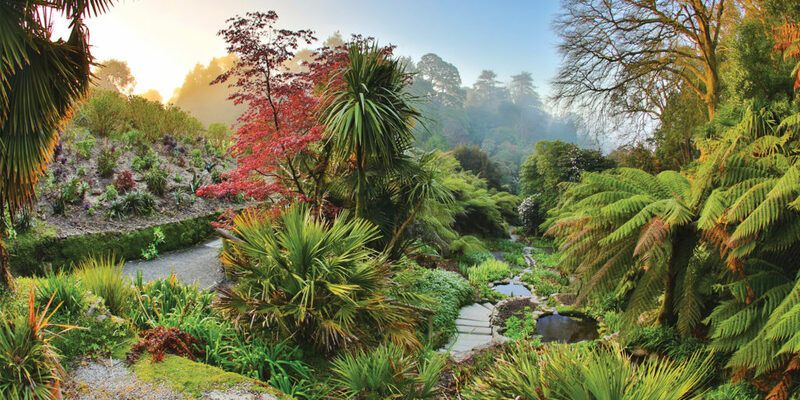 You’ll find verdant landscapes replete with large ferns and palms, great collections of camellias, and luscious valley gardens such as Trebah and Glendurgan that cascade down to the water’s edge. 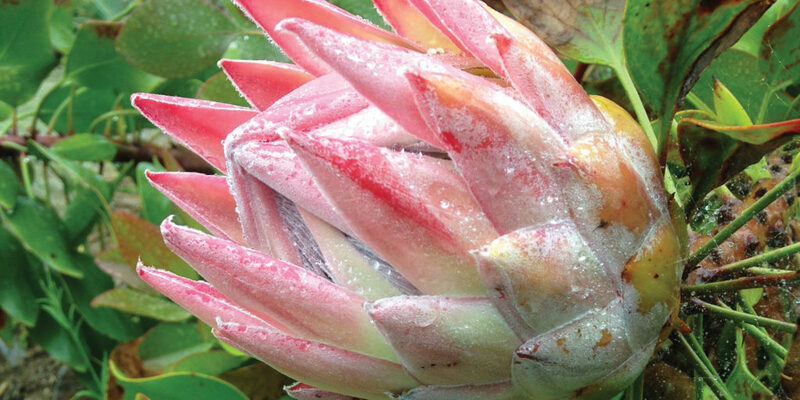 Many of these collections of rare plants have origins in the travels of explorers and horticulturalists of years gone by, who brought back exotic specimens from distant lands, and found the Cornish climate to be perfect for them to thrive. These collections have matured and steadily been added to over the years, becoming the world-class gardens they are today. 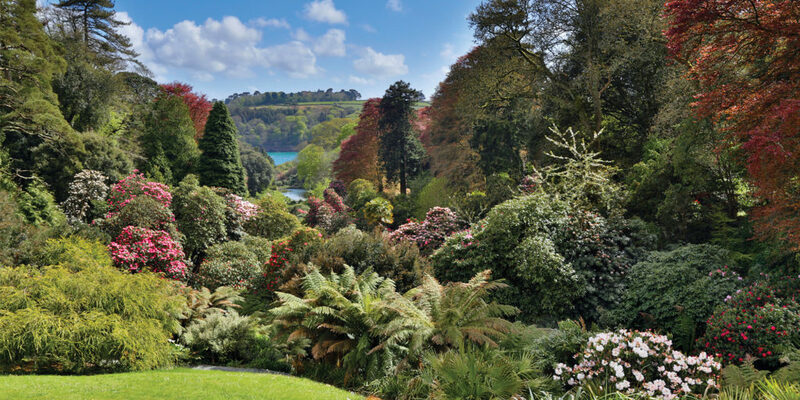 One most certainly to put on your list is the subtropical paradise of Trebah Garden in Mawnan Smith, on the edge of the Helford just outside of Falmouth – neighbour to the equally magnificent National Trust managed Glendurgan. Complete your tour of the garden with a stop at Trebah Kitchen, serving delicious home-cooked delights. A more recent addition to the garden is the wonderful amphitheatre, home to fantastic open-air theatre and live performance over the warmer months. Discover more about Trebah’s summer programme here. With such an evocative name, you’re simply compelled to discover more about the Lost Gardens of Heligan – a stroke of marketing genius! Owned by the Tremayne family for centuries, Heligan Estate was once home to thriving, pretty gardens. Yet the land on the estate gradually turned to disrepair and became overgrown in the early to mid-20th Century, accelerated in large part by the lack of men to work the ground during the two World Wars, and the house’s acquisition for the respective war efforts. Within a generation or so, almost all trace of the former gardens had disappeared. It was only a chance discovery of small room in the derelict walled gardens on the estate in 1990 that sparked the regeneration project to bring them back to their former glory. And Cornwall is all the better for it. A day out at Heligan is a real adventure for all the family, with acres of land to explore and a huge variety of styles and plant species, contrasting dramatically from the structured Victorian Productive Gardens to the wild and wonderful Jungle. Incidentally, the gardens’ rediscovery and regeneration owe a lot to Sir Tim Smit, the man who was instrumental in creating the neighbouring Eden Project – another spectacle on the outskirts of St Austell that you simply must visit. 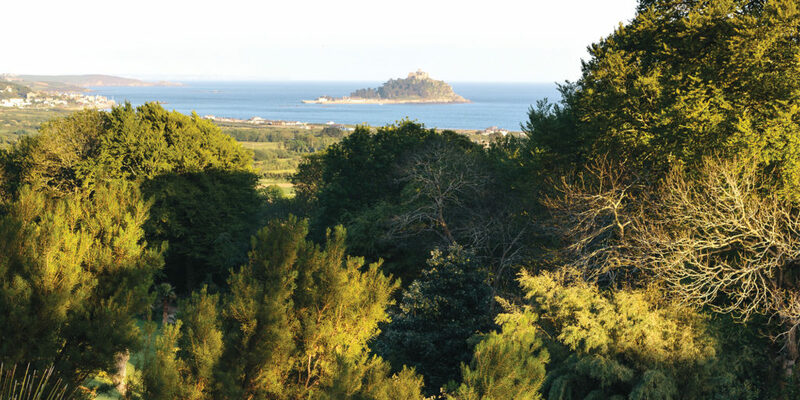 That two of Britain’s most awe-inspiring gardens are within such close proximity to each other is testament to both Cornwall’s horticultural excellence and the inspiring people who have helped shape these amazing spaces. Heligan is also home to Kneehigh Theatre’s Asylum. Discover more about upcoming summer events here. The National Trust manages a range of beautiful country homes and gardens across Cornwall, from the grand houses of Trelissick and Lanhydrock, both of which boast equally impressive grounds, to the aforementioned subtropical valley garden Glendurgan, complete with its own maze – fun for both children and adults alike. 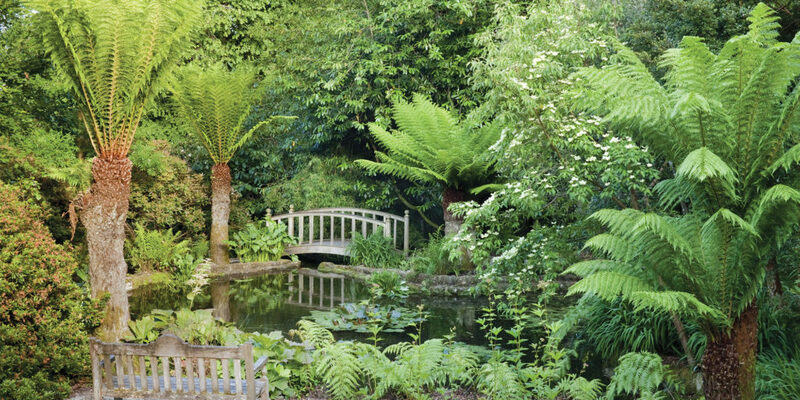 Another you may not have heard of – but should really seek out – is Trengwainton, one of the most southwesterly gardens on the mainland. Trengwainton is a lush paradise, awash with colour at this time of year. Typical of National Trust managed properties, Trengwainton is particularly family friendly, will excellent facilities and a fabulous café. With plenty of good paths, Trengwainton is particularly accessible for wheelchairs and pushchairs. There’s even an all-terrain mobility scooter available to hire on site. Dogs are also welcome on leads, so you needn’t leave any of the family at home! Tremenheere is a truly inspiring and thought-provoking garden, where you can appreciate art on a large scale in a unique setting. A beautiful, oak-framed art gallery was also added to the site recently, and there’s a fantastic kitchen serving scrumptious food too. As ever, we’ve just given a small taster of Cornwall’s many beautiful and varied gardens. It’s true, we could easily have chosen an entirely different list altogether. 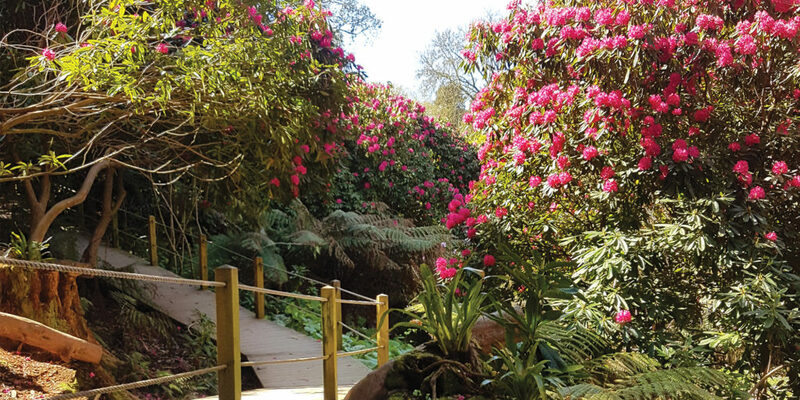 Yet with so many to choose from, we hope our selection gives a flavour of what to expect and spurs you on to discover Cornwall’s many gardens on your own. 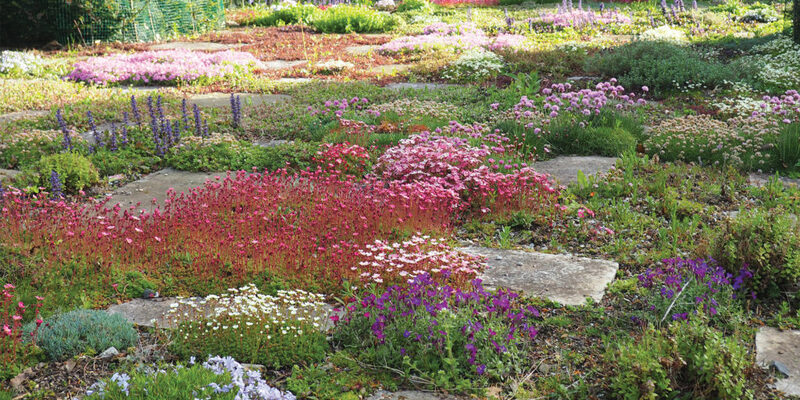 There are some inspiring things happening today in the field of landscape gardening and design today, as we discovered when we met landscape architect Elizabeth Staveley of LandArc. Find out more in our feature here.